The Iceland State Broadcast Service has its own news service, a Radio Building and Repair Department, and a Monopoly Sales Department for radio receivers. The Chief Engineer supervises the transmitting stations, control rooms and the Radio Building and Repair Department. 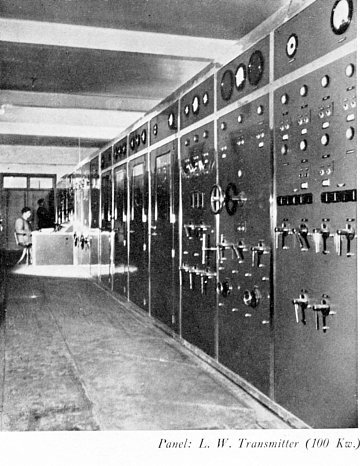 A long wave transmitter of 100 Kw. aerial power is operated at 9 kilometres’ distance from Reykjavik. The aerial is supported by two 500 ft. insulated steel masts. A special cable connects it to the studios in Reykjavik. The assigned wavelength is 1442 meters (208 kc/s), but during the war other wavelengths have also been used, and at present it is transmitting on 1107 meters (271 kc/s). A medium wave relay transmitter is located at Eiðar, in the eastern part of Iceland. Its aerial power is 1 Kw. A high quality receiver, with a unidirectional aerial, picks up the programs from the long wave transmitter at Reykjavik and directs them through to the relay transmitter 600 meters away. Special programs are occasionally broadcast through TFJ, the 7 Kw. 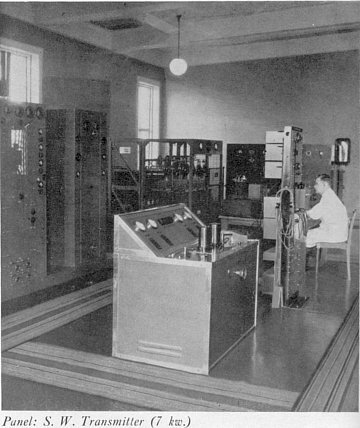 short wave transmitter at Reykjavik, which belongs to the State Post- and Telegraph Administration. This station has directional aerials towards New York, London and Copenhagen. The wavelength is usually 24.52 meters (12235 Kc/s). 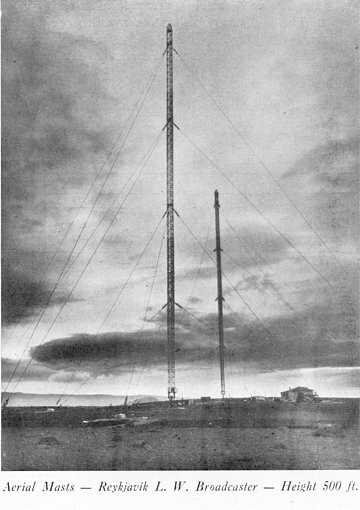 When this Broadcast Service was established, in the year 1930, there were practically no radio receivers in Iceland, but on July 1st 1943 there were about 24.400 registered radio-owners in the country, or roughly 1 set to every 5 of the population. The annual license-fee for each radio-set was 30 krónor until January 1st 1943, when it was raised to 50 krónor, due to the general increase in cost. Considerable revenues are also derived from broadcasting of spot-ads and announcements. The laws pertaining to the Iceland State Broadcast Service prescribe that all its revenues, including revenues from other activities under its supervision, such as the Radio Sales Monopoly, Radio Building and Repair Department etc., shall only be used to promote the broadcast activity for the common good of the nation. Considerable amounts are spent annually on radio repair and educational tours through the country, and on educational courses, which are arranged for those who wish to study radio technics for the purpose of repairing radio-sets and advising the public in their proper use. Funds have also been allotted annually to promote the erection of small electrical units for the purpose of charging radio-batteries, mainly in the farming and rural districts. There have annually been an average of about 2400 broad-cast hours. The programs have been of a similar arrangement and character to the radio programs of the other Scandinavian countries. A special emphasis is put on rendering an efficient and reliable news service. Four languages are being taught: Icelandic, Danish, English and German. Esperanto was also taught for several years, but has now been discontinued. There are more Icelandic broadcasts of a political nature, such as discussions from Althing and election disputes, than in any of the other Scandinavian countries. The difficult communications and great distances have prompted our politicians to agree upon the desirability of such broadcasts. 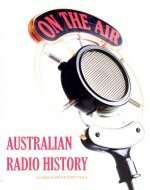 One or two talks, or a reading, are daily features, and radio plays or dramas are broadcast once a week during the greater part of the year. Outstanding vocal and instrumental soloists are featured at least weekly, besides which there are quite frequent performances by vocal and instrumental groups. The Iceland State Broadcast Service maintains a small orchestra ensemble and a mixed choir. Frequent performances are also given by teachers and pupils of a local college of music, and the male voice choirs are yet another popular feature. Music from gramophone records is also broadcast daily. 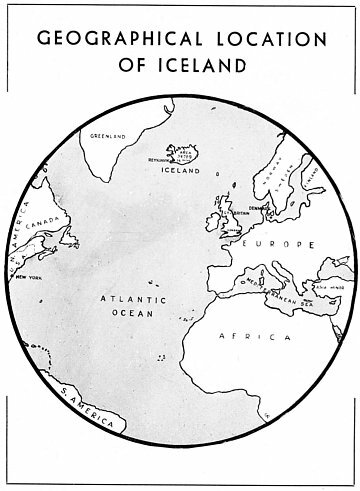 During the war the Iceland State Broadcast Service has leased considerable broadcast time to the British and United States Governments for the purpose of broadcasting news and entertainment to the Allied Forces in Iceland, and there has at all times been perfect cooperation between the parties concerned. Few nations in the world are more dependent on the broadcast service than the Icelanders. The country is large and the settlements are scattered around the coast and cut off from one another by mountains, which often are impassable. And since there are no railroads in Iceland, winter communications are rare and difficult. With the introduction of broadcasting every remote valley has thus been brought into the high tide of civilization. This diagram dates from 1938. Due to present conditions, an up-to-date comparison cannot be made. 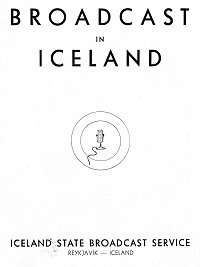 It will be noted, that in 1938 Iceland had 131.0 receivers per mille of population. Now the corresponding ratio is 198.5. 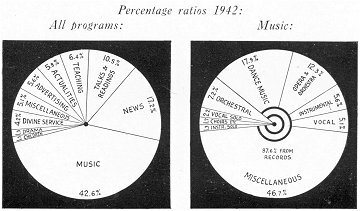 Accordingly the number of radio licences has increased by 51.5% since then. A large proportion of the Icelandic nation depends upon the sea for sustenance, both in merchant ships and fishing vessels. 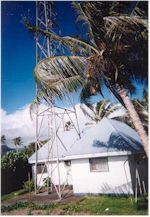 The radio has been instrumental to keep them in closer touch with land than would otherwise be possible, both through the regular programs and through the broadcasting of general and personal messages to seafaring people. In peacetime the broadcast of weather reports in three languages, and notices of missing ships and boats, have proved to be most effective in safeguarding the lives of fishermen and merchant seamen of many nationalities on the sea around the coast of Iceland. Hence the broadcast service is of the utmost importance to the Icelandic nation, to its industries, educational and cultural life. It is the quickest and most efficient means of communication, which has bridged great distances, increased the knowledge and education of the most isolated inhabitants and urged cultural progress. From early times it has been a national custom in Iceland that during the darkest winter-days the families on the farms and in the rural parts of the country would gather in their living quarters with their handiwork, while someone would read aloud to them from the Sagas or some other literature of interest. 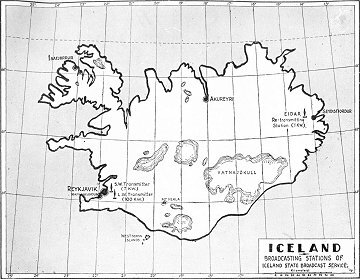 This custom is abating somewhat, due to altered conditions, but the radio is now providing entertainment and education on broader lines with the aim of increasing the happiness and independence of each home and to strengthen the unity of all Icelanders into one national family, sounder and happier than ever before. This booklet was issued in English in 1943 by the ISBS shortly after invasion of neutral Iceland and occupation by [first] British and Canadian and [second] US military forces because of concerns over possible Nazi Germany plans for occupation [at the time Germany occupied Denmark which controlled Iceland]. a. Sales-Monopoly on Radio Receivers. 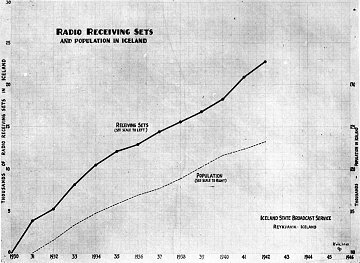 When the Iceland State Broadcast Service was established in the year 1930 there were about 450 receivers in the country, merely used for listening to foreign stations. These receivers were of about 100 different trademarks and were imported by businessmen who had no technical knowledge, solely for the sake of profit. It soon became evident that neither could spare parts for all these trademarks be secured nor would there be a possibility of efficient repair service, and that consequently importation of receivers would have to be under control. 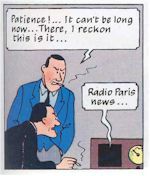 A sales monopoly on radio-receivers was therefore decided by law. 1. 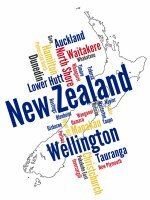 Only the best trademarks have been imported and in quantities corresponding to the demand. 2. Sufficient supplies of spare parts have been secured. 3. Radio-owners are registered by the Monopoly whereby general control and collection of licence-fees are facilitated. 4. The Monopoly has given some profit which goes to the Iceland State Broadcast Service. Paragraph 2 of the law pertaining to this Service enacts that all revenues of the Service and its affiliated services shall merely be used for promoting the activities of the Broadcast Corporation, and the State is therefore not allowed to benefit by these revenues. 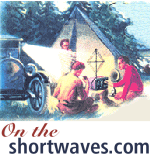 From the first repairs of radio-receivers was one of the most difficult tasks. Very few men had the requisite technical knowledge and they all lived in Reykjavik. 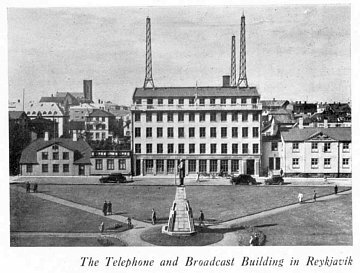 It was evident that radio-owners would have great difficulty in having their receivers repaired and for that reason the Broadcast Corporation established a repair department already in the year 1931. Educational courses in radio-repairs were held for young men from various parts of the country and later repair-tours were made for the purpose of repairing receivers and instructing radio-owners in their proper use. A repair-shop has now been established in Akureyri and will also be established elsewhere when circumstances allow. It is worth mentioning that the Broadcast Corporation has from the first rendered financial aid to the inhabitants of the rural districts to erect small electrical units for charging radio-batteries. Windpower-stations are now very common in these districts, and by applying vibrators the radio owners no longer have need for the tedious dry-batteries. When the Broadcast Corporation was established the local newspapers had a news bureau of their own, which had reporters in most parts of the country. At first the Broadcast Corporation had cooperation with this bureau but soon found that independence in this as well as in other respects was essential. The political struggle has always been rather harsh here in Iceland as in most countries of small population, and the news from the political parties were therefore usually not suitable for broadcasting. Paragraph 5 of the law pertaining to the Iceland State Broadcast Service decides that the Service shall maintain strict neutrality towards all political parties, public viewpoints, enterprises, and private men. It has often not been easy to maintain this rule and to avoid criticism from the disputing parties. 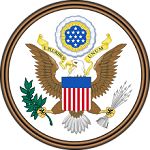 The News Service and the management of the Broadcast Corporation are sovereign, i.e. they decide what news and advertisement are fit for broadcast publishing and even the Government of the country must abide by their decisions. The inhabited districts are scattered and severed by high mountain ranges. There are no railroads. Communications are now tolerable during the summer months as most rivers have been bridged and roads laid, but some remote districts have still no means of communication except by sea. In winter most roads are closed by heavy snow. The country must avail itself of the broadcast as a means of communication, for spreading news and advertisements over the country. Broadcast advertisements enjoy ever increasing popularity and now take a considerable part of the broad- cast time. The charge is kr. 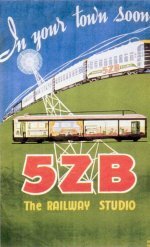 1.00 per word and the revenues of the Advertisement Department were in 1944 about 1/3rd of the total revenues of the Broadcast Corporation. The Broadcast Corporation had no funds when it was established in the year 1930. The State supplied the funds for erection of a 16 Kw transmitter and also working capital during the first years. The Corporation has later repaid this working capital, paid interest on the first capital and supplied the necessary funds for later developments, such as power-increase to 100 Kw and erection of relay station at Eiðar in the eastern part of the country. Some funds are now available for the erection of a new broadcast-house in Reykjavik. 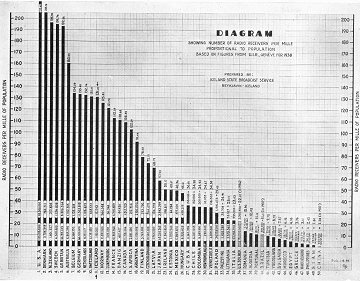 In 1930 there were only 450 radio-owners in Iceland but now they are about 28.000 or 22% of the population, as shown in a diagram in the booklet, ”Broadcast in Iceland“. Foreign receiving-sets have not been available during the past years, but when importation of same again is made possible it is estimated that the number of radio-owners will quickly reach the figure of 30.000. The Broadcast Corporation has always been hampered by insufficient housing conditions and the various activities have been scattered about the city. 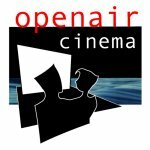 It has now been decided to build a new broadcast-house in Reykjavik and building operations are scheduled for next spring. An American architect, Mr. Wm. Lescaze, one of the most outstanding architects in the United States, is making the drawings. All costs will be borne by the Corporation and radio-owners. Some funds are available but the remainder will be got by enhancing the annual licence-fee from kr. 60.00 to kr. 100.00. 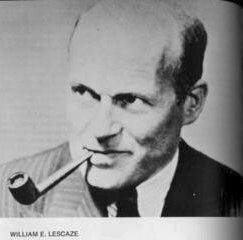 William Lescaze was a Swiss born pioneer of modernism in American architecture. He also designed studios for KNX Los Angeles, WABC New York, the CBS Theater New York, and other buildings including WLW, WBBM and CBS San Francisco. We have a sales-monopoly on radio-receivers and the radio-owners therefore pay no special licence. 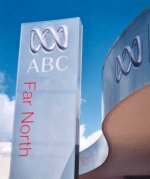 Licence-fees are paid for the right to avail oneself of the broadcasted material and all radio-homes must pay this fee. According to paragraph 18 of the broadcast regulations, radio-homes are thus defined. 2. The home of every independent individual. 3. Schools, hospitals, restaurants, places of employment etc.